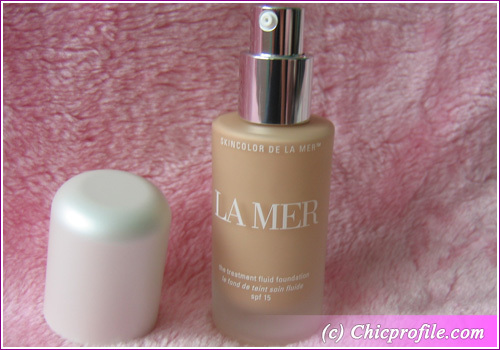 After I’ve tried La Mer’s Treatment Fluid Foundation for the last few weeks time has come to finally write a review about this product and the Foundation Brush. 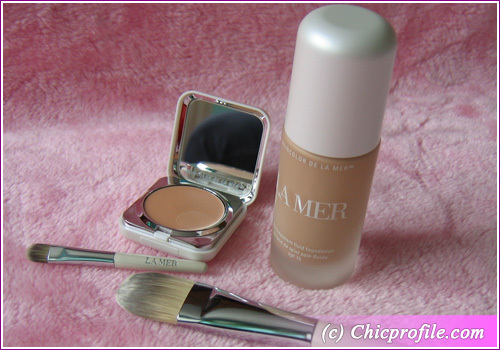 Both products are from the Skincolor Collection which also includes Radiant Concealer SPF 25 (review), Powder, Powder brush, Treatment creme foundation SPF 15 and Treatment powder foundation SPF 15. I can say a more then a few great things about this product but I will just make it quick. First of all is the packaging: elegant, simple and chic in the same time (even the little white box is silky to the touch). 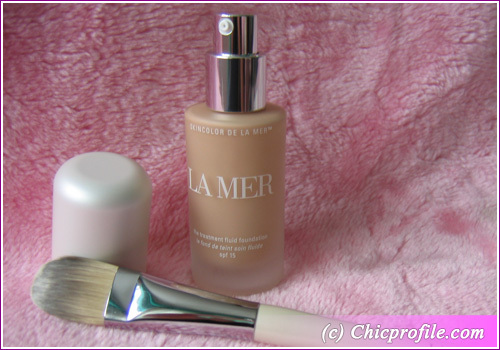 The foundation comes in transparent bottle with a white elegant cap. Underneath the cap you’ll find the pump which makes it all easy. I just love foundation or lotion bottles that come with a pump. Application is so much easier. The foundation brush comes in a transparent clutch. SPF 15: We all know what that means! I’ve got protection while wearing my makeup all day long and I don’t need to wear sunscreen under the foundation. My skin is safe during the day and I would recommend you to use foundations, concealers and other makeup products that have SPF. The range of colors: Comes in a 10 different shades and it’s enough for everyone to pick a color since the palette varies from the most light colors to those made for darker skin. 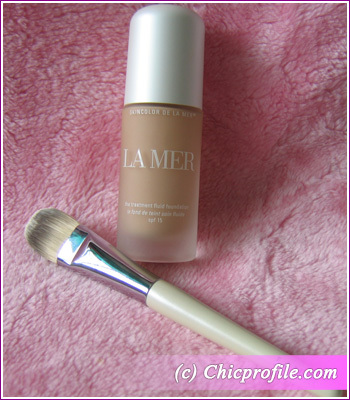 I have the Creme shade which goes very well with my skin tone. 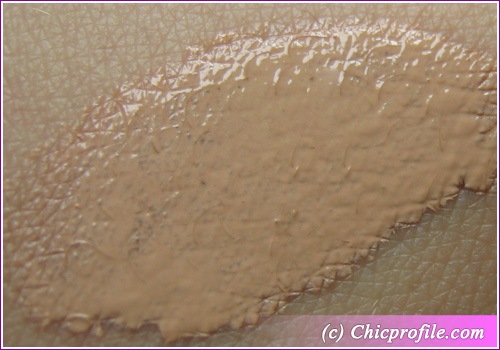 Has a silky texture, can be easily blended and doesn’t feel heavy on the skin. I actually have the feeling that my skin can breathe. Instantly adds radiance to your complexion and gives you a natural healthy look. Here you can see one of my FOTD while I’m wearing this foundation. I’m no expert in applying fluid foundation with a brush, but as a beginner as I am everything worked out pretty well. 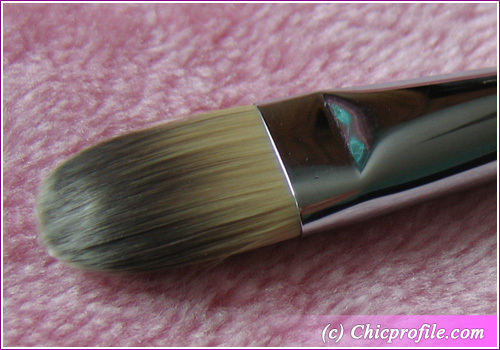 The bristles are soft but not too soft, so the application went out perfect, the brush glided easily onto my skin, blending the foundation without leaving brush strokes behind. 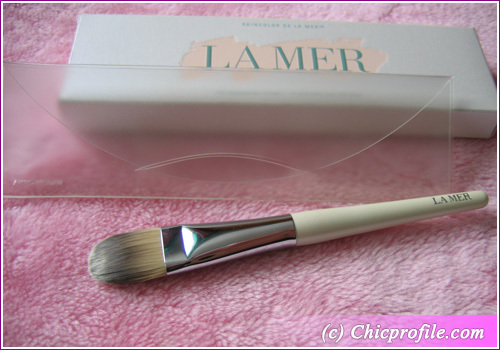 Is quite a big brush so it covered large areas of my face quickly. I like it also because it doesn’t absorb too much product. If you have uneven skin tone or some pigmentation this will be a great product for you, since is not only a foundation that covers the imperfections but also a treatment. I have an oily type of skin but sensitive in the same time and I’m happy that this foundation is moisturizing but not greasy and I need only a small amount of it and in a few seconds my skin has the perfect color. I’m satisfied with only a pump but sometimes even half of pump is enough for the whole complexion. 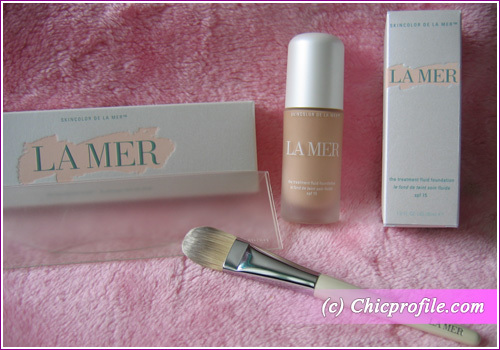 I guess you are expecting this since we are talking about La Mer. 🙂 Well yeah, it’s the $ 85.00 price which I know that many can’t afford it. 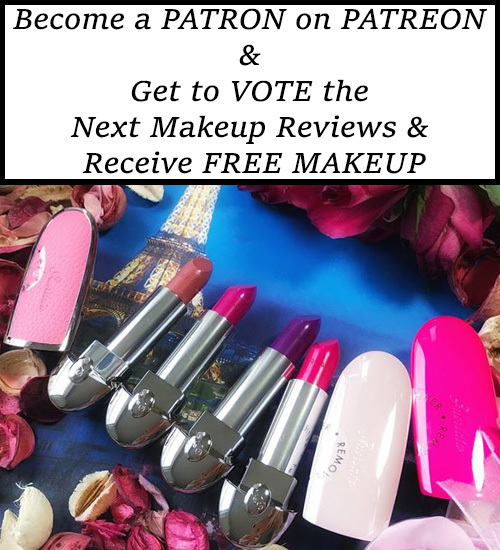 If you do want to make a sacrifice and buy this foundation you will give yourself a luxurious treat. It’s a treatment, a foundation and also has SPF 15. 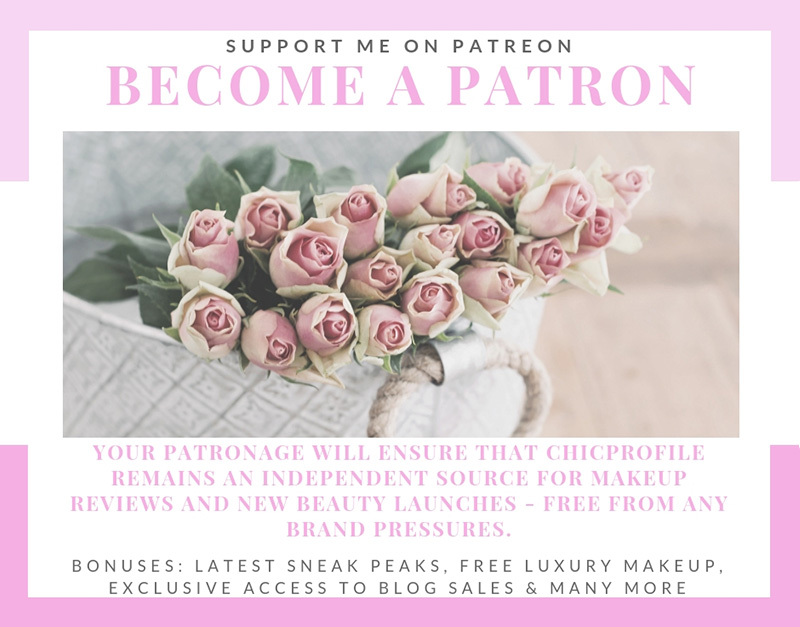 It has a medium coverage which was not enough for me when I had some breakouts because it didn’t cover them enough and I couldn’t have that porcelain flawless look that I was craving for. Rather then that the coverage is OK if you want to hide redness, dark circles or some pigmentation but I wanted more coverage for those breakouts. It’s sooo strange you should post this now! You know how I’m hunting the perfect, liquid, ultralight foundation, right? Well, I came across this brand just last Friday, and got all exited after I tried it on. It’s so smooth, so wonderful and so PERFECT for my skin. Luckily I asked the price before grabbing it, which I normally don’t. 236 $!!!!!!!!! I repeat: 236 $. WTF??! .-= maryinwonder´s last blog post: Yves Rocher sale! =-. Hi! 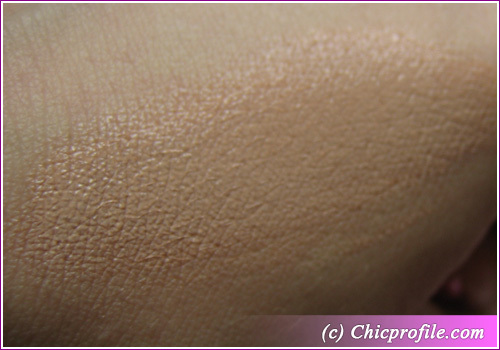 You can check out my Fluid Foundation preview post…the link is inside this post.